Welcome to Board Watch for WCCUSD’s April 11th Board of Education meeting at Lovonya DeJean Middle School! This week, our board members are scheduled to: approve a contract for reading and writing support services at Madera, Bayview, and Dover; hear a presentation from National Demographics Corporation regarding the process and criteria for drawing a trustee-area boundary map, which is a requirement for the potential transition from at-large to trustee-area board elections in our District; and be presented with an update on the Early Literacy Campaign. Consent Item D.1. This consent item is relatively small but reflects the relevance and need for our ongoing work advocating for improved data practices in our District. 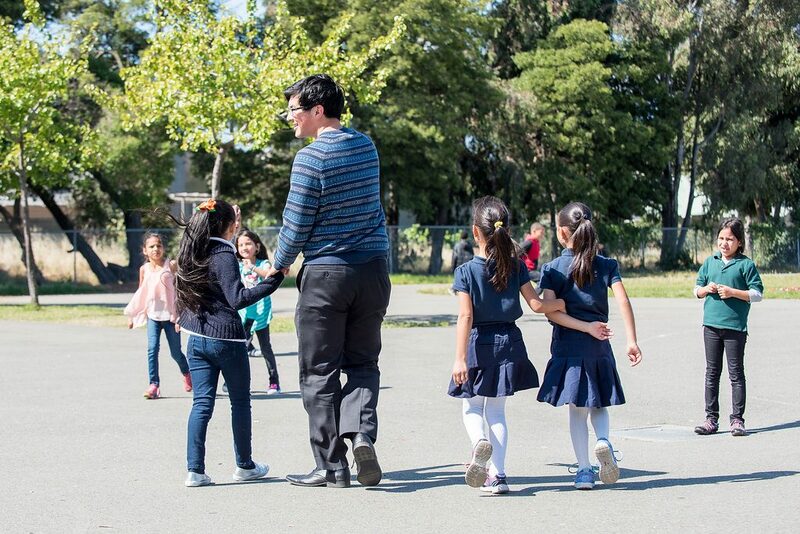 The contract for $89,000 (the annual cost of funding a teacher) seeks to support ten teachers across three schools to develop a cohesive writing program at Madera, Bayview, and Downer Elementary Schools. This deliverable is an output and not an outcome. The partnership is with The Reading and Writing Project Network that has already developed a comprehensive reading and writing program in use in many different District schools. This minimal description of program with almost no outcomes/deliverables leaves us with many questions. It is unclear what the scope of work will be and how it will differ from the extensive curricular content already developed by this contractor. Will this “cohesive writing program” be shared beyond the three identified schools or will it cost $89,000 for each set of three schools that need development? DATA IN ACTION // As we look to our Strategic Use of Data Rubric we see that every area, except for one, scores in the “Basic” level. The rubric helps us raise many questions about this contract being recommended for approval. How has The Reading and Writing Network implementation fared at other school sites and how have student outcomes changed as a result? What are the identified student impact goals and associated incremental targets? How will impact be monitored? What is the formal review process and timeline over the course of program implementation? Beyond this first short-term expenditure, are there any additional costs associated with full implementation? The request for this funding receives an overall score of “1”. Here is an example of the program proposal that would receive a strong or exemplary rating. As an outside organization, we do not know all the relevant details, but this document can serve as a sample of what our community and board members should expect to see when asked to make decisions to invest in programming, policy, or budget shifts. These questions should already have been answered internally at the District central office, and therefore, it should not be difficult to share this externally with the public. If we invested in this process, we would take a huge step forwards towards transparency and strengthened governance. Each time we spend money for our students, decision-makers must be equipped with a basic set of accompanying information to understand what they are deciding and how monitoring and accountability will take place moving forward. We have spent millions of dollars on programs and partnerships over the years amounting to very little improvement in student achievement. It is time we demonstrate the discipline and clarity at the outset of every key decision to identify clear goals and targets, and use data to monitor progress over time. At least then we would know which programs to continue and scale, and which do not adequately serve our young people. Lastly, this contract is for services that began in October 2017 and are set to be completed in just a few months. Why is this contract just now coming to the Board for approval? Why is interim data not included, considering five months of implementation have already occured? Will our board members take action in response to this proposal in alignment with the Strategic Use of Data Resolution they unanimously passed last October? Discussion Item F.1. Board members are currently elected in “at-large” elections, where each member is elected by voters throughout the District. At the March 21, 2018 meeting, the Board considered adoption of Resolution No. 64-1718, indicating its intent to transition from at-large to trustee-area board elections, in which members are elected by voters in geographical subdivisions of the District. Such elections require the Board to adopt a trustee-area boundary map. A representative from National Demographics Corporation is scheduled to present information to the Board and public on the process and criteria for drawing the trustee-area boundary map. Following the presentation, the Board will hold the first of two public hearings to receive community input on the process. Once the public hearing has concluded, the Board may choose to have a discussion regarding the criteria to be used in the first draft of the boundary maps. 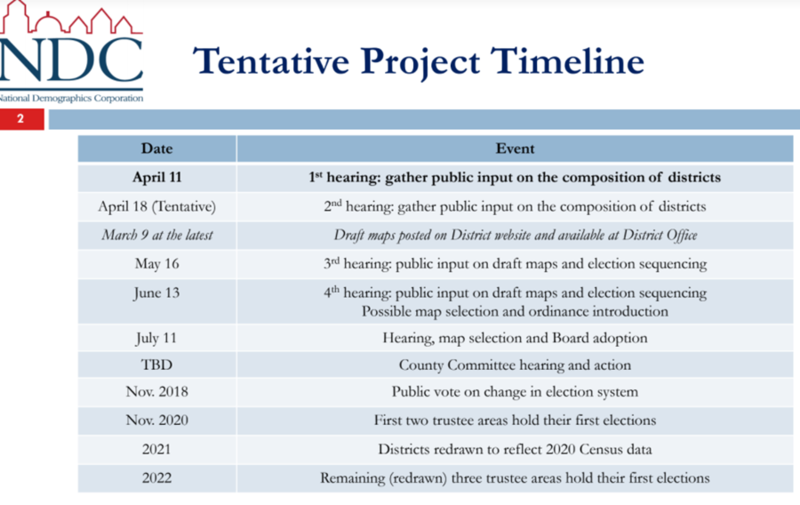 Below is the timeline for the process to transition from at-large to trustee-area elections. A key step will be the development of boundaries to define voting “districts”. Community input is essential to ensure fair and clear boundaries are drawn. What is your neighborhood or community of interest? Do you prefer your neighborhood be kept together in one district or have multiple representatives? What are other specific communities of interest in the District that should be considered when drafting maps? Discussion Item F.2. Staff are scheduled to provide the Board with an update on the District’s Early Literacy Campaign. This report seeks to share baseline data on fall assessments for preschool and Transitional Kindergarten (TK) students using the DRDP and growth data from fall to winter on the Kindergarten Foundational Skills Assessment and the STAR Early Literacy and Reading. There is a significant amount of data shared throughout the report. Charts are broken down by ethnicity and subgroup. Overall, the presentation lacks in-depth analysis. While growth numbers are shared, no reflection is provided to name whether numbers are on- or off-track. There is no reflection on why Pre-K, Kindergarten, and 1st Grade performance is strong while our 2nd and 3rd graders experience significantly lower student achievement. Is the 5% growth for these grade levels between fall and winter considered on-track? There are no proposed action steps to remedy the large gaps in 2nd and 3rd grades. Context, analysis, and targeted next steps are what make data powerful for our students. Simply reporting numbers will not ensure improved student outcomes.